Rumors are flying about what Apple has in store for its users Monday when the company shows off the next versions of OS X and iOS 5, and iCloud, a new online service. Apple set off a rumor feeding frenzy Tuesday after the company announced that CEO Steve Jobs and a cast of Apple executives would introduce the three new products during the keynote for the company's Worldwide Developers Conference. All bets are on Apple introducing a new online music streaming service, but Hollywood could be in the mix as well. Your Mac looks like it will be just as trackable as your iPhone (but in a good way). Twitter and Apple are rumored to be working on a new iOS feature, and the new iWork suite for iOS may hint at a new iCloud feature. Ready for the latest Apple rumor extravaganza? Let's dive in. Nobody knows for sure what services iCloud will include, but the biggest rumor is that you'll be able to stream your music to any device via the Web. Apple has reportedly signed deals with the four major U.S. music labels -- Universal, Sony, EMI and Warner -- according to The Wall Street Journal. The new service will reportedly work similar to Lala, a company Apple acquired in 2009. Apple's iCloud will reportedly scan your library for tracks you own and then allow you to listen to the songs online with no need for uploading files as you have to do with Amazon's Cloud Drive and Google Music Beta. But it's not clear whether you'll be able to stream your entire music collection including ripped CDs from the cloud or just your iTunes purchases. Another big question is how much the new cloud service will cost. Beyond music, Apple for more than a year has been trying to convince TV and movie studio executives to allow their content to be streamed via iCloud, according to CNET. Apple released a new version of its iWork office suite for iOS including Pages (word processor) , Numbers (spreadsheets) and Keynote (presentation) on Tuesday. The three new apps are now universal, meaning they will work on your iPhone or iPod Touch as well as on the iPad. Besides giving iPad users a free upgrade, the new apps have caused some to speculate that Apple may include file sync capability with iCloud. You can already upload files from your iOS device to Mobile Me's iDisk or iWork.com, but these solutions do not include a seamless sync option that iCloud could offer. There are many other Apple apps that could benefit from seamless file sync between Mac and iOS devices such as unfinished Garageband and iMovie projects. Another big question hanging over iCloud is whether the new service will complement or replace MobileMe. Twitter appears to be hard at work creating its own image-sharing capability similar to third-party services such as Twitpic and yFrog. TechCrunch uncovered test links of the new image sharing service online. Note the URL in the previous link uses ".../status_photos/..." suggesting these are photos from Twitter tied to a specific status update. Rumor also has it that Twitter is working with Apple to include one-touch image sharing baked into iOS devices. This feature would work similarly to the "Send to YouTube" button included in the video share options in iOS. You may be more likely to misplace your iPad or iPhone than your MacBook, but it looks like Apple may include a Find My Mac feature in Lion. 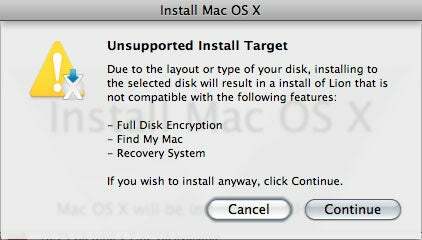 A MacRumors reader recently installed a preview build of Lion on his Mac when he received a pop-up window telling him his disk would not be compatible with several features, including "Find My Mac." If the feature does shows up in the final version of Lion, Find My Mac would presumably be similar to Find My iPhone. The popular service lets you see your iOS device's general location on a map. You can also to send an MMS alert to your phone, set a lock code, or remotely wipe your personal data from the device. Apple already includes a Back To My Mac feature that allows you to remotely access your Mac. Back to My Mac has actually thwarted several bungling criminals, including a dancing fool on YouTube (NSFW). Japan-based blog Macotakara says an anonymous source has told then the next version of the iPhone, dubbed iPhone 5, is still on track for a summer release. The new device will reportedly have an 8 megapixel camera and will not use a conventional SIM -- possibly an allusion to the previously rumored embedded SIM. The conventional wisdom is that Apple will not announce any new hardware this year, despite announcing a new iPhone at WWDC every year since 2007. Lodsys, the patent holding company that recently threatened to sue iOS third-party app developers for patent infringement, has made good on its promise. The company on Tuesday announced it would sue several developers in response to Apple's letter warning Lodsys to back off. The patent company is even offering a $1,000 bounty to iOS developers if Lodsys loses in court. It's unlikely Apple will publicly address this issue during its keynote on Monday, but you can bet there will be some unofficial Lodsys-related news coming out of WWDC next week. Apple's keynote begins at 10 a.m. Pacific on Monday, June 6.